The Milwaukee Brewers put up double-digit runs for the first time since June 12, rolling to a 10-5 win over the Seattle Mariners at Safeco Field. Kyle Lohse allowed 3-runs on 6-hits in 7-innings of work to earn his 8th win (8-7) of the season. It was his first victory since July 24. The Brewers broke the game open with a 5-run 6th inning. Four of the five runs scored on Yuniesky Betancourt’s grand slam home run. Nori Aoki, Jeff Bianchi, Martin Maldonado and Scooter Gennett all added two hits in the win. Ron Roenicke was ejected in the 4th inning, just his second ejection of the season. Game 2 of the series is tonight. The Milwaukee Brewers built their winning streak to 3-games Wednesday with a pair of wins over the Chicago Cubs at Wrigley Field. Milwaukee took game one 6-5 after battling through some adversity. 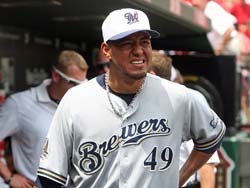 With the Brewers leading 2-0, starting pitcher Yovani Gallardo had to leave the game in the 5th inning with a left hamstring strain. There was no word on the severity of the injury. 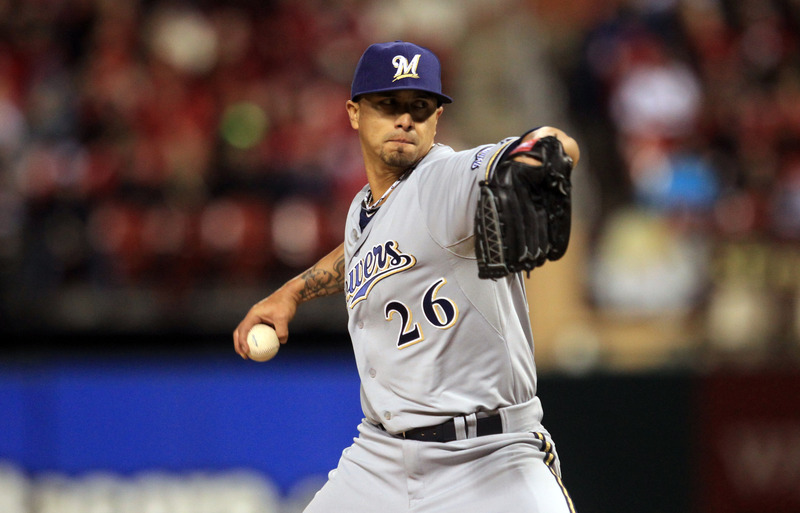 After Gallardo left, the Brewers quickly fell behind 5-2. In the 7th, Khris Davis sparked the rally with a 3-run home run, his 2nd of the season. Jean Segura drove in the game winner with an RBI-double later in the frame. Segura and Yuniesky Betancourt provided the early offense with solo homers. The Milwaukee Brewers wrapped up the first leg of their six-game road trip with a 6-5 loss to the Colorado Rockies Sunday afternoon. Milwaukee had a 5-4 lead going into the 8th inning before giving the ball to the recently sure handed John Axford. The last time Axford picked up a loss was on May 1st. Since then, he had worked his ERA from 10.32 down to 3.38 and had a stretch of 33-scoreless outings in 36-appearences. Sunday, Axford fell to 4-4 on the year by allowing consecutive doubles to Troy Tulowitzki and Michael Cuddyer as part of a 2-run 8th inning for Colorado. Yovani Gallardo’s disastrous 2013 hit another low Thursday afternoon. The Brewers’ opening day starter couldn’t make it out of the 4th inning as the Brewers fell to the Padres 10-8 at Miller Park. night and Carlos Gomez scored all the way from first base to give the Milwaukee Brewers a come-from-behind 4-3 walk-off win over the Oakland A’s on Miller Park. The Brewers trailed 3-0 early. Kyle Lohse, who gave up four home runs in his previous start, served up a pair to Oakland’s Yoenis Cespedes. Lohse, despite tweaking his hamstring, made it through six innings, once again getting little to no offensive support. Lohse had tweaked his hamstring earlier but didn’t think it was serious so he stayed in and helped save the bullpen. John Axford worked a scoreless 10th inning to earn the win for the Brewers, who will play for the series win this afternoon at Miller Park. Lohse is off to a 1-5 start and he’s 0-3 against his former team. Lohse allowed four runs on six hits in the fourth inning and the Cardinals made that hold up for a 4-2 victory. The Cardinals improved to 8-2 this season against the Brewers. They won for the 14th time in the last 17 games and finished a 10-game home stand with a 7-3 record. The Brewers got 10-hits on the day, but all 10 were singles. They scored their only two runs in the sixth inning when Yuniesky Betancourt and Jeff Bianchi each collected run scoring singles to score Nori Aoki and Ryan Braun. The Brewers finally return home to host the Los Angeles Dodgers at Miller Park tonight. Yovani Gallardo (3-3, 4.50) vs. Clayton Kershaw (4-2, 1.40) in the pitching matchup. Former Brewer Zach Greinke will pitch against the Brewers on Tuesday night. After being roughed up by the St. Louis Cardinals over the weekend, the Milwaukee Brewers needed a solid outing by a starting pitcher and that’s exactly what they got from Wily Peralta. The Brewers rookie right hander worked 6-solid innings, allowing two earned runs on five hits. Peralta picked up his 3rd win (3-2) of the season. the 8th inning today as the Pirates came from behind to beat the Brewers 6-4 at Miller Park. The loss ended Milwaukee’s 9-game win streak over the Pirates and prevented the Brewers from pulling out a 3-game sweep. Rookie right-hander Hiram Burgos worked seven solid innings, allowing just 4 hits and two runs with one walk and six strikeouts. Axford has pitched just 11 1/3 innings and has given up 6 home runs. That’s just 4-home runs shy of his entire total last season. Axford left to a chorus of boos at Miller Park. The Pirates hit 3-home runs in all, beating the Brewers for just the 8th time in the last 54 games at Miller Park. Carlos Gomez continued his hot hitting for the Brewers, collecting two hits and a home run. 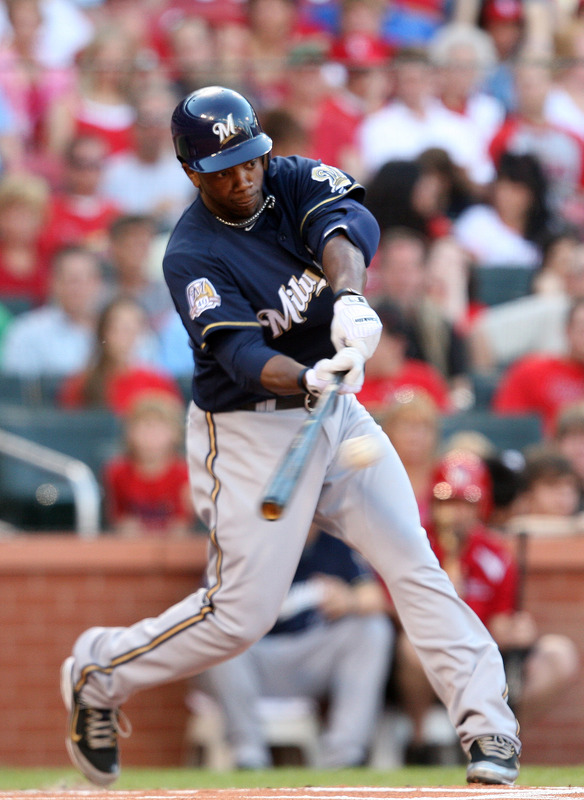 Yuniesky Betancourt also homered in the loss for the Brewers. Rickie Weeks started the night hitting .167. Three hits later and Weeks finished the night hitting .191. The Brewers second baseman clubbed a 3-run home run and drove in five runs in Milwaukee’s 12-8 win over the Pittsburgh Pirates. Weeks put together his first multi-hit game since April 3.
straight over Pittsburgh and improving to 43-7 against the Pirates at Miller Park since the start of the 2007 season. The Brewers also earned their 8th straight win at Miller Park overall this season. The Brewers also got home runs last night from Yuniesky Betancourt (6th) and from Jean Segura (3rd). John Axford pitched a scoreless 8th inning and Jim Henderson worked a 1-2-3 9th. Brewers starter Marco Estrada couldn’t hang on to a win opportunity. He served up home runs to Russell Martin and Andrew McCutchen. The Brewers go for the sweep this afternoon at 12:05pm. Hiram Burgos (1-0, 3.27 era) goes for the Brewers. Jeanmar Gomez (1-0, 2.63 era) pitches for the Pirates. rebounded with 5-home runs and a 10-4 win over the 1st place Pittsburgh Pirates at Miller Park last night. Nori Aoki, Carlos Gomez, Yuniesky Betancourt, Jean Segura and Yovani Gallardo all clubbed home runs for the Brewers. Segura also tripled and had 3-hits in all, lifting his average to .364. Segura earned his 11th multi-hit game of the season. Yovani Gallardo (3-1) started slow, allowing a run in the 1st, but he settled in, pitching a season-high seven innings. He allowed 2 runs on 3 hits while walking 2 and striking out 5. With their victory, the Brewers clinched a winning record in the month of April at 13-11. That, after a 2-8 start to the season. Game two of the series is at Miller Park tonight. Marco Estrada (2-1, 3.86ERA) pitches for the Brewers. James McDonald (2-2, 4.38ERA) goes for the Pirates.